Let’s face it, tournament fishing is a male-dominated sport. Fishing women have been striving to make a name for themselves in the co-ed format of tournament fishing, but few have prevailed. On June 23, 2018 North Carolina’s Bass Nation set sail in the BASS Eastern Regional in an effort to win their third championship title. Out of 350 anglers, 175 co anglers and 175 boaters, one was co-angler Angela Mayo. Though encouraged by her husband for many years to fish with him, Angela resisted at the hand of raising their children and her career as a legal assistant at Sigmon, Clark, Mackie, Hanvey, and Ferrell. Once she agreed, he used his 40-plus years of bass-fishing knowledge to teach Angela everything he knew. She was a quick learner and a natural angler. Thus, a great woman angler evolved. 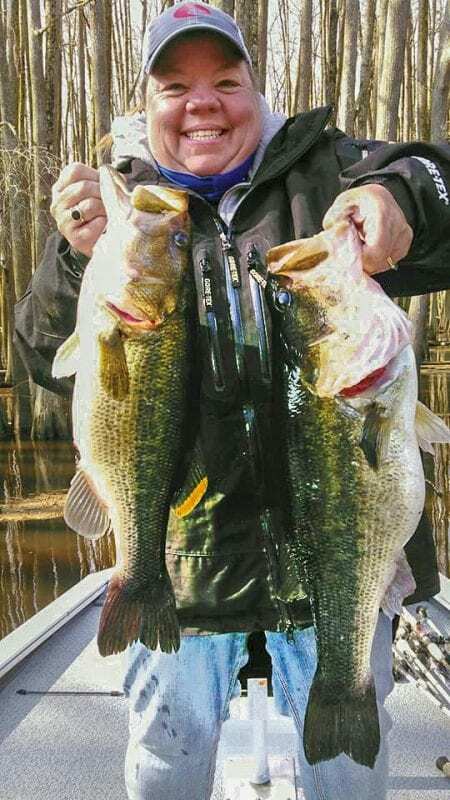 They fished many tournaments together, and in 2014 she joined the Ladies Bass Angler Association (LBAA) as a co-angler. In her second LBAA tour, she earned Co-Angler of the Year. The very next year she braved the venture of “taking charge” and moved over to the boater’s side. In her first year as a boater, she won the LBAA’s 2016 Rookie Angler of the Year. Dr. William Straka… and the list continues to grow as she makes a name for herself in the industry. She also joined a local bass fishing club, Thermal Belt Bassmaster, as a non-boater, and quickly advanced as a state qualifier. She won for her team on Lake Wylie, which left her as one of the top 10 anglers with a spot at the BASS Eastern Regional tournament held at Winyah Bay, S.C.
Anglers from 47 states and nine countries participate in these events. Only those at the top of their game earn their way to the next level. During the BASS Eastern Regional, Angela made history for North Carolina and women anglers. As she weighed in her third day limit, the emcee announced that she had won, making her the first female on the North Carolina non-boater team to move on to the national championship. Angela will compete as a non-boater for the first two days of the BASS National Championship on Nov. 8-9 at Lake Pickwick. The leader after day two, who will have already won a boat, will move on to the boater’s side to compete. On day three, it’s an even playing field with everyone competing to be one of the top three anglers to obtain an invitation to the Bassmaster Classic! No Fishing women have ever fished a Classic qualifying through a co-ed platform. Remember Angela Mayo. She has already achieved a “first” in fishing history, and she has a solid chance to obtain another.